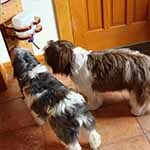 PAWS Creations welcomes your feedback and pictures. Please click here to submit your Feedback. I would like to sincerely thank everyone who has taken the time to let me know how much they appreciate our efforts, via the below feedback or the phone calls I have received. PAWS Creations treats each and every order like a gift we are making for someone special, an item they will use and enjoy having for many years to come. Each order has a little part of us in it, our creative spirit, our hopes that when you receive your order you will start grinning as soon as you see the shipping box in anticipation of opening it. From start to finish we really do try to touch your lives and bring you a little happiness, a smile, a grin, a lifting of your heart and invoke a feeling of contentment that you are very pleased with our efforts and well satisfied with your order. When we started this journey (please see About Us) we never expected to receive back all that we have. You have lifted our hearts and made us grin because you let us know how much you value and appreciate what we do through your feedback to us and when you recommend us to others. 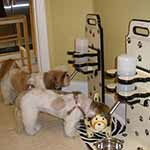 It is so exciting for us when we get a call or order saying that so and so recommended you to us or they saw our stands at a friend’s house and just had to have one for their pet. 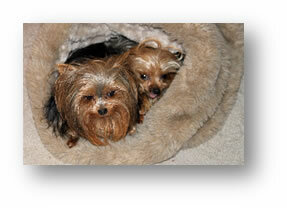 Sending you pictures of my teeny, tiny Yorkies; Cassie and Muffin. 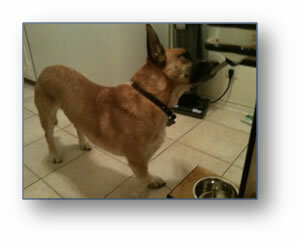 Cassie is the one with the spine problem and has difficulty eating and drinking from the floor position. 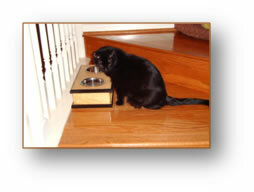 I am hoping that your Pet water stand and the 3-inch Small pet dinette will help her eat and drink better because she will not have to stretch or strain her spine in order to do so. 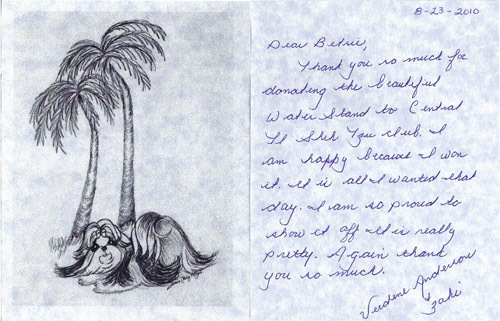 I am so sorry for the delay with writing this email to you but thank you so much for the beautiful water stand! We all love it! And thank you for being so accommodating with our color request. The burgundy Paw Prints turned out very nicely! Thank you again Betsie. We will definitely recommend the stand! 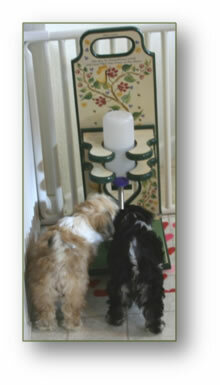 Betsie - I just wanted to let you know the stand arrived on Tuesday. It is wonderful! Beautiful and very well-built. What a relief! My little boy loves it. 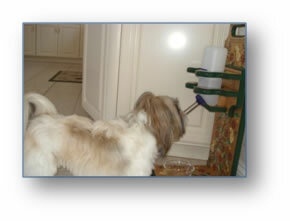 I received your bottle stand in good condition and was really pleased with it. I have 5 small dogs that use it. 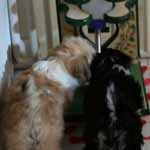 My Shih Tzu puppy was the first to try it out and gradually the others decided that they would try it out after watching Benji use it for a few days. 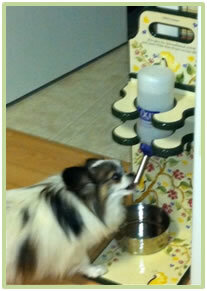 Here is a pic of my Papillon, Brady using it. Thank you so much. It is truly "one of a kind" in that you created it just for us. I have been showing it off to all my doggy friends. 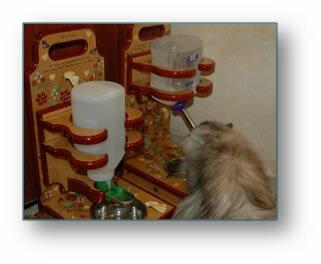 We received the pet adjustable water stand last Friday, and it's great! Our Persian kitten no longer has water stains on his cheek. 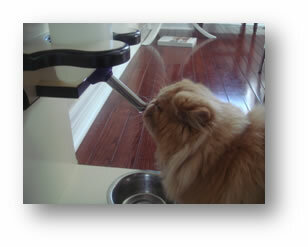 To train him to use the water bottle, at first we put water infused with tuna flavor into the bottle. 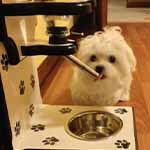 Today, he seems to be drinking the water all by himself. 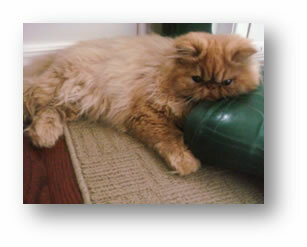 Attached are a couple of photos of the kitty. Thanks for the great stand! 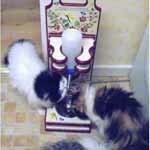 Sorry it has taken me so long to respond with a picture of my babies using your water bottle stand! 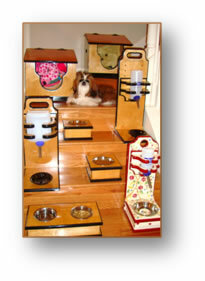 I will probably order an additional stand when my next litter comes, around the middle of October! Thank you Betsie. Thanks again for your help! 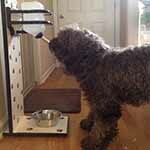 Bingley has learned fast how to use PAWS and it's really great to not have to clean up water from the floors. It's a great product. Thanks! I received my PAWS today, thank you for your help in purchasing the right height. Now there will be no more slobbered water on the floor! I've attached some pictures of Bingley enjoying the stand. We love our water bottle stand. Do you mind if I list your website as a resource on my own website? 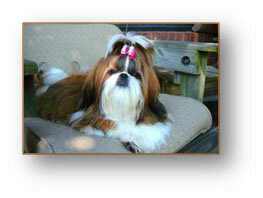 I am a breeder of Shih Tzu, and am in the process of building my website. Hey Betsie, this is my squad. The water bottle stand works great! No more wet stinky faces! 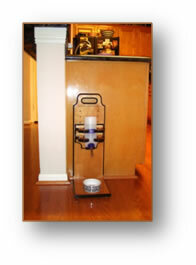 We wanted to let you know we could not have been happier with our recent purchase from you of an adjustable water stand. We were very impressed with the quality and extra care you did in wrapping it. I am sure we may order another one down the road. It pays to buy "Made in America". I searched everywhere for a standalone water bottle holder in Japan, because having water in a water dish is not very sanitary due to the dusty condition in urban areas. The only one I could find was for hamsters. 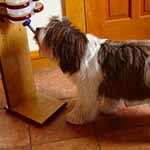 We could only find water bottle attachment for cages, but our puppy outgrew the cage a few months ago, so we started searching American websites. Your products are unique in a way that they actually look good setting around in a room. We will surely enjoy it for a long time! Thank you for communicating with us so well. You were very helpful. Thank you so much for your hospitality; it was a pleasure purchasing this product from your company. 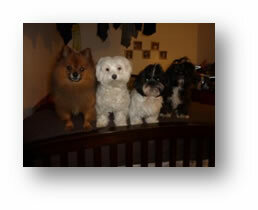 I will continue to promote your products to my friends, I will keep in touch and send you pictures of my babies. My breeder absolutely loves her stand. She says it far exceeds the old wooden one she had before not just in beauty but also in how functional it is to just slide the water bottle in and not have to hook it up with a cord or anything. Thank you so much for including the thank you note for me. I appreciate it! There are probably more water stand orders in my future and you’re the only place I will ever shop! I ordered 2 water stands from you (last fall) and absolutely love them. 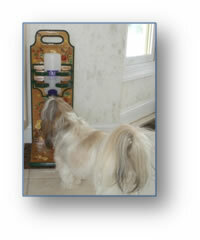 I'd like to order another one of the same as a gift for my breeder. Is there anyway you could ship it directly to her? I believe the blue trim would match her kitchen best and I know she'd prefer the 32 oz in the same size as the previous two I ordered. Situated in Irvine, North of Ayrshire in Scotland. 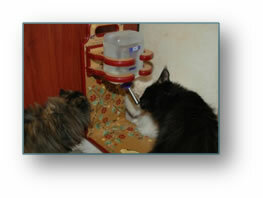 Just to let you know my cats just love your water stand at first they were so inquisitive to say, "what is this "
Thank you, very much, I just love it, it is beautiful. Hope you like the photos. I added the link for your website to my website's Favorite Links page. I also wrote you a review and sent a photo. Thank you again so much! 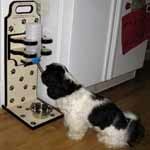 I love your beautiful water bottle stand! I wish I was talented like you so I could craft such a lovely product! 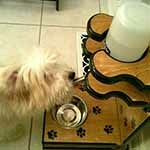 Subject: Website Feedback: I Love the Paws Creations Water Bottle Stand! The water bottle stand is a winner! Thank you so much for your fast, friendly service and a great product. 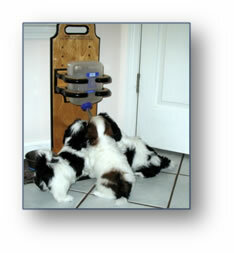 My Havanese puppies took to drinking from the water bottle right away. The stand is very sturdy and also very pleasing to the eye. It serves its purpose perfectly! Thank you again. 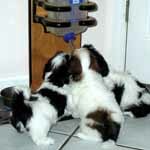 I wanted to let you know that I received the water bottle stand in time for the arrival of my new puppies. It is absolutely beautiful and very well made! Thank you so much for your quick, efficient customer service. I will write up a review and send you photos on a weekend coming up soon. I will also add you to my website Favorite Links page. Thank you again! Wishing you a healthy and prosperous 2010! 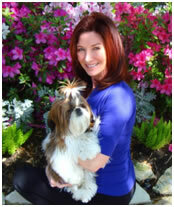 Listen to some “rocking” music while you visit Michele’s website. Your feet will be dancing and tapping to the beat! Sorry, I wait babies and so, the days… and nights are very busy…. So the life is wonderful…. 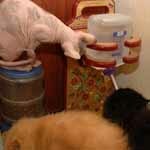 You are an angel for the Persian breeder…. All is arrive this morning….. It’s wonderful!!!!!!!!!!!!!!!!! I’m so happy!!!!!!!!!!!!!!!!!! There is no water on the floor……….the paradise!!!!!!!!!!!! Thank you, thank you, the life is so beautiful with the water stand….lol…. When I’ll receive them, I’ll take pictures, and I’ll send to you. 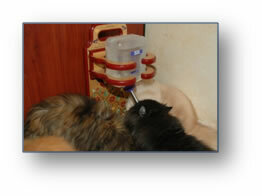 My husband must remake my website and he’ll put a link to your website, and pictures of the water stands with my cats. 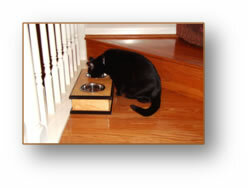 Can you make 2 modified pet adjustable water stands, and 2 small pet gourmet stands, in the same color as the others? Thank you and I wait with impatience….. I received last week the 5 box. They are very beautiful. I’ll take pictures and I’ll send to you. I’d want to ask you a question: I have two cats who don’t want to drink to the bottle baby, so I tried all I know to learn them, but it’s impossible, they don’t want. 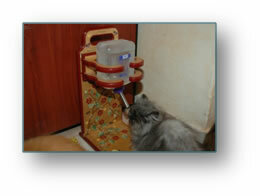 So, I must put a bottle (special bottle for Persian that they sell in France), for them. 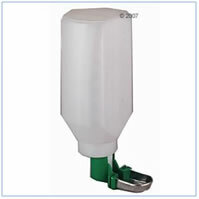 Is it possible to make a water stand for this bottle? The bottle must be keep around and under the cup. If it’s possible I must send you the measure of the bottle. This is a picture of the bottle. FYI: For those interested in getting this bottle the link is posted below. 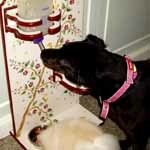 I do not stock this bottle so you would have to purchase it and then send the bottle to me in order for PAWS Creations to make a stand for you like we did Michele. Instead of a drinking tube this bottle has a little drinking cup. I just received it this morning and It's very beautiful. My cats look at it like it was a very strange thing. Some of them know to drink like that but the others no, so I think that a little adaptation is necessary. I'll send you pictures. I'm so glad you like the photos. I really wanted to show off all our Creations in one photo, and I think it worked. I posted the photo on my Facebook page, and one of my friends said Scarlett looked like she was in a store, and were all of those really hers! LOL! Of course, I put your name under the photo so people would know where all the beautiful pieces came from. I only have 23 friends, though. Hopefully Vernelle will be better at getting the word out, she has hundreds of friends on Facebook. I wish I could have written a more effusive note to go with the photos, but I am so drained from taking care of my mom. Maybe you can pull quotes from past emails to go with the photos that would more aptly convey my enthusiasm. The double dinette is so perfect. 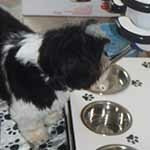 The spacing of the bowls is brilliant, close but not so close that Penelope will drop food into the water bowl. Did you see the scar on the side of her neck? She is a rescue who came to live with us less than a year ago, after my grandmother's cat died (she was with us for five years after my grandmother passed). 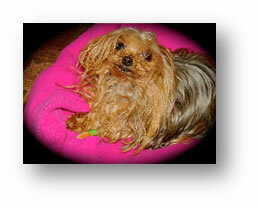 Penelope was attacked and then left untreated in her own home until her neck wound became abscessed. She is such a sweet little girl, and so grateful to be here with us now. She also had four puncture wounds on the bridge of her nose, and both of her ears were almost torn off. Now she is well and living the good life! And she has her very own custom made bowls! Please send me the link to your new website when it is up. And when you get your Facebook page up, be sure to friend me. I am under my full name, Gayla Herald. I use my page to share photos and that's pretty much it. I posted a new photo of Scarlett every day when she was still growing, I called it "A Scarlett a day...". Anyway, I'm glad to hear you had such an amused response to the photo, that is exactly what I was going for! 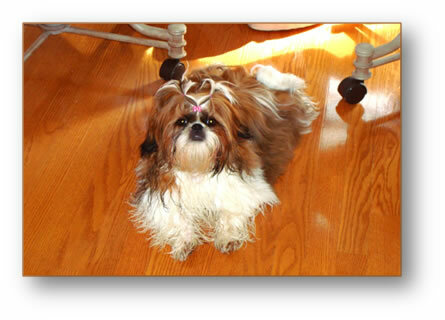 I am always on the lookout for doggie bows, so if you know anyone with a website please let me know! Penelope's dinette came this week! It is beautiful! She inspected it and accepted it immediately! Thank you for being so willing to accept a custom order and to make and ship it in such quick fashion. 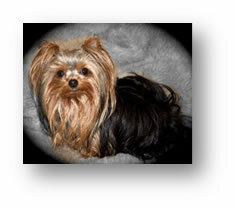 We did photos last night, so you can see that one little dog really does need two or three of everything! 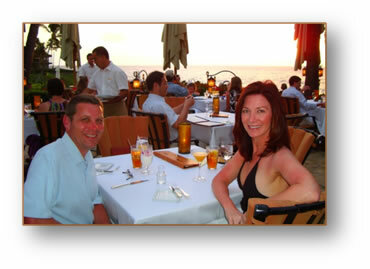 I am also attaching a photo of us the afternoon we ordered the custom travel stand while we were on vacation in Hawaii! We enjoy your products so much. Each item is like a piece of furniture and looks beautiful in our home. The custom travel bottleholder/dinette combo is already well traveled and everyone remarks on how beautifully it is made. Anyway, I'm excited for you to see the photos. OMG!!!!!!!!!!! It's here!!!!!!!!!!!! I went to my dad's overnight and when I drove up to my house this afternoon I saw your box sitting on the porch! Sooo exciting! It is BEAUTIFUL! I love all the detail in the painting and your signature in the corner! It is such a work of art I am going to have to find another room in my house to leave it out permanently! I'm looking forward to the first opportunity to take it somewhere with us so we can show it off! Every detail is so beautifully finished! I love the little dinner dish holder and how easily it detaches to all lay flat for the occasions we may need to pack it to take with us when we travel. You executed every detail of my request perfectly and artfully. Thank you so much! 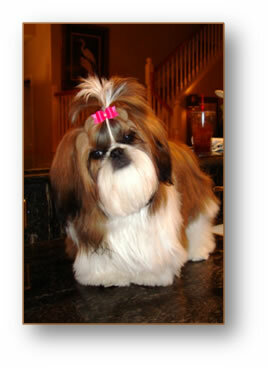 Tomorrow I am grooming Scarlett and then we are going to take lots of photos for you with all our Betsie's Creations! P.S. 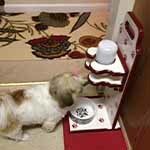 My dad's dog, Annabelle, loved her dinette and ate dinner from it last night! Subject: Our boxes have arrived! And it is like Christmas at our house! It is so exciting to see the FedEx man carry in the fancy paw print boxes! I think Scarlett knows immediately they are for her! We are beyond thrilled! The toy boxes are every bit as beautiful as I anticipated! The moldings add such an elegant touch! And thank you so very much for the new dinette! I can't wait to fill it and put it next to the bottle stand upstairs! Scarlett loves eating from the other one every night! I will leave the toy boxes to air for a week per your suggestion and then we are going to stage a huge photo shoot and send you beautiful photos of your work in it's permanent home! Really, you should think of it as an art installation! Your products are all so beautiful and so consistent in their quality. We are going to love having your products in our home for years to come. And the little heart stickers on the mailing labels are such a sweet touch. And the smiley faces on the dinette box made me smile! Thanks again for everything, you'll be getting photos soon! Subject: Just received my new dinette! OMG!!!!!!!!!!!!!!!!!!!!!!! Thank you SO MUCH! Sorry for yelling, but I'm excited! I am going to love the new dinette, and so will Scarlett!!!!!!! 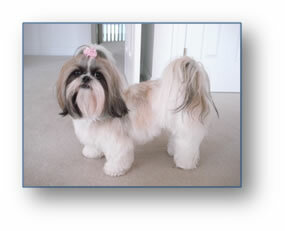 I will give my old one to my dad, for his dog Annabelle. She's a country girl and doesn't get nice things very often! You are very welcome for all the feedback, etc. You deserve it. You make a beautiful quality product. I am always excited to share good news when I can! And it is AWESOME!!!!!!!!!!!!!!!!!!!!!! LOVE IT!!!!!!!!!!!!!!!!!!!! Your products are so beautiful! I love having them in my home! Only the best for my little girl! Subject: I ordered a second one! I just ordered a second toy box! I wanted to let you know it isn't a mistake. I decided that it would be nice to have a complete set upstairs, too. So I will have two bottle stands, two dinettes and two toy boxes! They look so pretty and tidy. This one tiny dog has taken over my house! 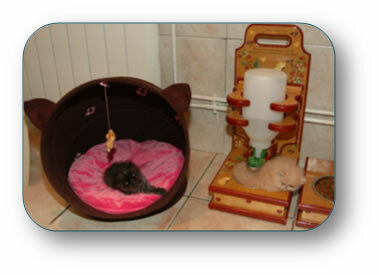 I have a grooming table up in my bathroom all the time, a professional dryer tucked under my vanity, toys everywhere! There was less stuff strewn about when my daughter was a little girl! Anyway, just a heads up in case making two at once is easier. I'm excited! Can't wait to get them! I will send you new photos when all our pieces are here! Our box just arrived and the dinette is beautiful! And, P.S., it does have all four feet intact on the bottom! I can't wait to get the perfect photo of Scarlett using them so I can see them on your feedback page! The second water bottle stand is going upstairs in the game room, and I will send photos of that one as well! Thanks again for such a great product! You are obviously dedicated to quality and practicality - a woman after my own heart! Thanks, Betsie! We are looking forward to receiving our new stand and dinette! Scarlett will be the fanciest dog around! 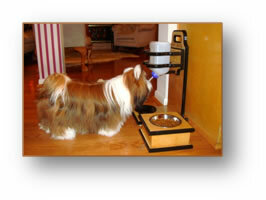 My breeder was very impressed with the photos of your product! She asked several questions because she said "people will want to know"! So I made sure she has the link to your website...and I also posted the photo on my Facebook account with the name of your company. Thanks for the heads up and the extra rubber feet! 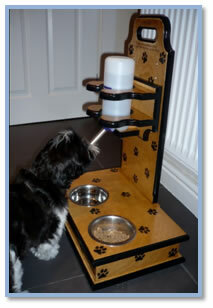 We love your products and will be sending you photos of them in use as soon as they arrive! 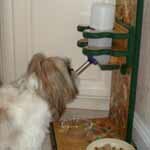 We love the water bottle stand! The box was fun with all the paw prints! As other customers have already noted, the quality surpassed my expectations. The stand looks sturdy enough to last forever! Scarlett took to it right away! In fact, we love it so much that we are going to order another one as soon as I finish this email! Oh, your quite welcome! Thank you for the nice comments about Lacey. 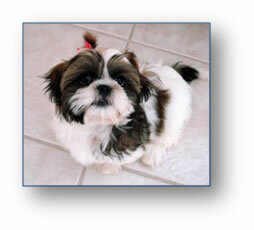 I am going to pass on your website to my friends at the groomer/kennel where Lacey goes. They were very interested when I told them about your beautiful items. Wishing you continued success with your business! 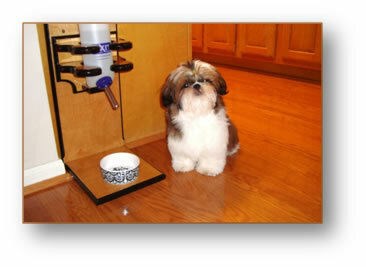 I just wanted to let you know that I received your water bottle stand. Thank you so much for the fast shipping. It is absolutely wonderful and your artwork is beautiful! 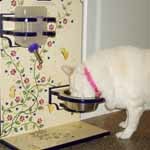 It looks great in my kitchen and Lacey is enjoying having water available any time that she wants it. 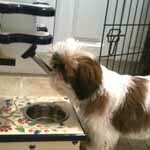 As we all know, Shih Tzu's can make quite a mess when it comes to drinking water! 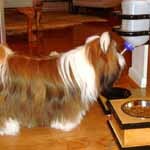 Attached are a few pictures, so that you can see Lacey drinking from the bottle. Happy to hear that you are swamped with new business!! Your products are so beautiful; I will help to spread the word. Lacey finally overcame her fears on her own. For a few days, I gave her a little piece of her favorite treat every time she drank the water. 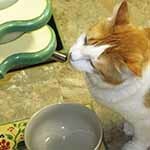 However, it seems that it is the stainless steel bowl that she does not like. I replaced it with a glass one for now. I want to take pics for you, but I still cannot catch her "in the act" of drinking! So, it may be a while before I can, but I will keep in touch. Good news!! Lacey has been using her new water bottle for a few days now. Yeah! Now I just have to try to catch her using it so that I can take the pics and send them to you. I will send a new email with attachments when I do. I just wanted to let you know that I received Lacey's new water bottle stand yesterday and it is absolutely beautiful!!! Thank you so much for the fast shipment. Unfortunately, she seems to be spooked by it and has not used it yet. I have it right next to her food dish. I figured that if she wants to eat, she has to get closer to the stand. So, she finally went to eat last night, but I could tell that she stayed as far away from the stand as she could. 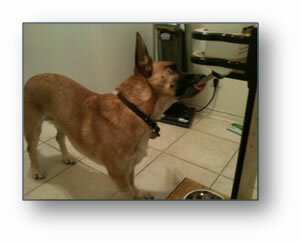 Instead of eating right in front of the food dish like always before, she stood on the far side of it! She is already used to using a water bottle, so I was surprised by her reaction. I think that it is the actual stand that she is not sure about. I guess it will take a few days of patience. 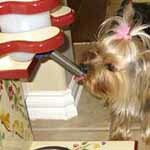 I did put some peanut butter on the outside of the spout, but she won't go to it on her own. I don't want to force her either. I would love to send you some pics of her using it, but it will probably take some time. As soon as she does use it, I will be happy to send the pics to you for your feedback page. If you have any other special tips, please let me know. 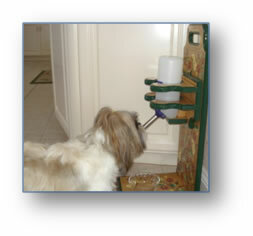 My sister-in-law has the same water bottle stand from PAWS Creations for her Shih Tzu which she ordered about 3 years ago. I really loved the stand and wanted one too. 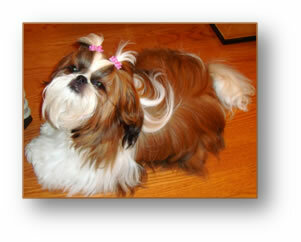 I also gave your website to our Shih Tzu breeder Wendy Hill (Wen Dee Shih Tzu). She was not happy with the company she usually recommends for water bottle stands and she really liked the pictures we showed her of your website.